I spy with my Ray-B-covered eyes a retracement play on EUR/USD! The pair is having trouble gaining momentum after passing the 1.0600 mark and technical indicators aren’t making it any easier for the bulls. 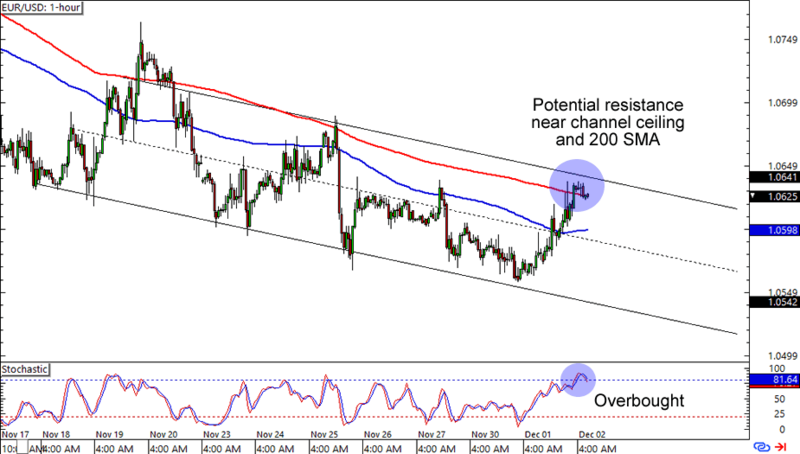 For one thing, EUR/USD is hovering just below a falling channel resistance. Not only that, but it’s also near a 200 SMA line! The cherry on top of the bears’ sundae is an overbought Stochastic signal. Think the euro is about to see losses against the Greenback? Stops above the 1.0650 handle could make for a good trade if you believe that the pair isn’t done falling just yet. Of course, you can also wait for a break above the technical levels if you’re one of them dollar bears. Here’s a countertrend play for ya! 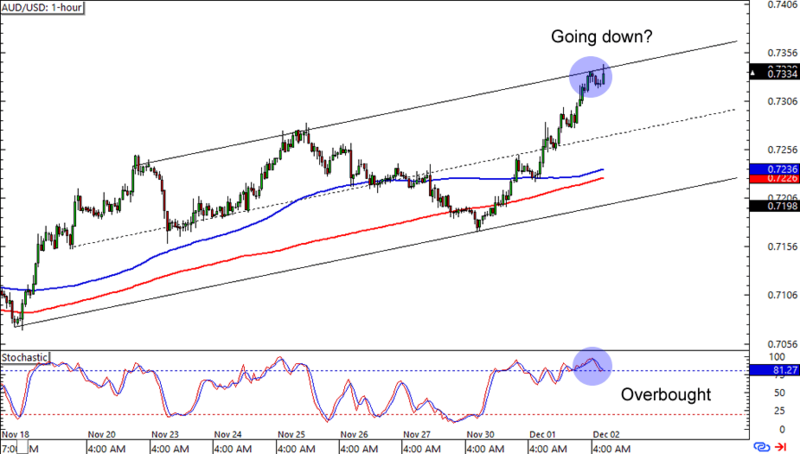 AUD/USD has been blazing higher this week but it looks like it’s encountering resistance just above the .7300 mark. Will this translate to a retracement (or even reversal) for the pair? A channel resistance is currently holding back more gains for the Aussie and an overbought Stochastic signal doesn’t help either. Like in the EUR/USD setup above, a short at market prices with stops just above the resistance levels could give us pips, especially if you aim for the mid-channel area. Just remember that countertrend trading isn’t for everyone and you gotta be extra careful about trading against the trend if you’re not used to it. A handy dandy trading journal and a solid risk management plan would help! Last up is a simple support setup on GBP/NZD. 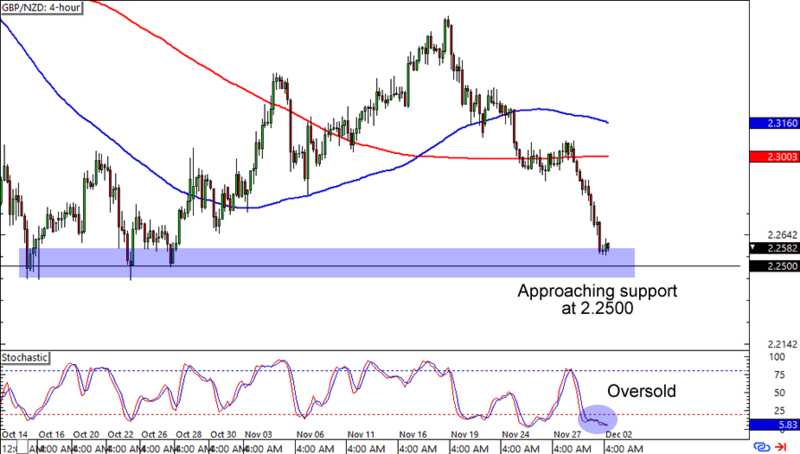 The pair is fast approaching the 2.2500 mark, which had served as a major support level since mid-October this year. What makes this setup sweeter is that Stochastic is also flashing an oversold signal. A long trade at the major psychological handle is a good idea if you think that the pound is about to reverse its fates against the Kiwi. But keep your stops wide, aight? Currency crosses tend to be more volatile than the majors, so wide stops are necessary.